My husband and I, because of our shared love of music, decided to splurge this year and purchase a package of six concert tickets from the Atlanta Symphony Orchestra so we could enjoy some of our favorite pieces and perhaps discover a few new ones. Our first concert was a perfect starter as it featured selections from The Ring of the Nibelung by Richard Wagner and Ludwig van Beethoven’s immortal Symphony No. 9. As a trombone player who relishes powerful melodic lines and bass parts that are heavier than potato and knockwurst suppers, Wayne naturally adores Wagner (and Mahler…and pretty much anyone else who is of Germanic descent and writes music featuring brass instruments). As a French horn player, I can enjoy chamber music as easily as opera, and I am often treated to a stunning performance by someone on my instrument at every performance I attend. However, I must say that I prefer the powerful and dramatic works of the romantic composers, and I especially love the ninth for its history and the political turmoil that played into its creation. (Check out this book I read if you’d like to learn more about it yourself!) We began the afternoon with a lovely supper at Cafe Intermezzo that involved a huge slice of peanut butter chocolate cake and espresso and ended with sweet harmony. It was a true delight! After a dinner of Jambalaya and Shrimp Etouffee at Front Page News, we headed to the Woodruff Arts Center for our second concert, which featured Nyx, a new composition by Esa-Pekka Salonen, and Le Poème de l’extase (The Poem of Ecstacy, Symphony No. 4) by Alexander Scriabin. Both pieces are, as one would expect, marvelous. However, the reason I chose this particular concert was the third selection for the evening—The Bells by Sergei Rachmaninov. I have always wanted to learn more about him as a composer, and I thought it was a bonus for a word nerd like myself to be introduced to him via a piece that came about because of a poem by Edgar Allan Poe of the same name. 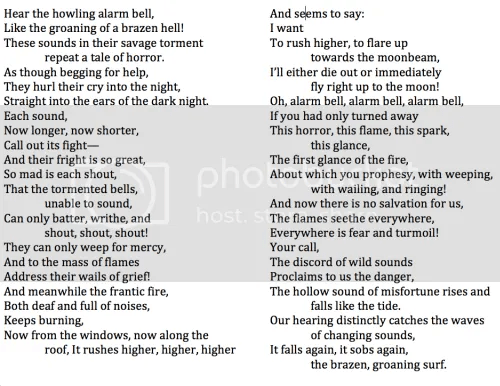 Having taught it before, I knew all about Poe’s use of onomatopoeia and other poetic devices to create the sounds of different types of bells and explore their symbolic meanings. It’s a poem that almost begs to be sung from the page, and I was excited to see how it would sound in the hands of a master like Rachmaninov. This movement opens with a jaunty, crisp feel full of bells and other percussion, flute trills, and muted trumpet. (It honestly sounded like the inside of a snow globe might when you shake it.) The horns and other brass round out the introduction and then give way to the tenor soloist who enters faintly, his voice growing in volume, to tell us “The sleighs rush along in a line.” And then, oh mercy, an absolute brick wall of sound erupts when the entire choir joins him to tell the story of the silver sleigh bells! The chord they form is massive, rich as chocolate ganache, and I swear it blew my hair back even all the way in the balcony where are seats were. The movement then alternates between the gossamer opening to the more mellow section in which the soloist sings of the delight that follows in death when the “days of delusion” are over and we travel into the bliss of oblivion. Finally, he ends on a climactic note of triumph. In the concluding bars, the orchestra gives the audience a taste of the sweet tranquility of that place by using long, fluid lines in the string section and light touches of flute and oboe to accent it like the delightful twinkling of the stars. The entire piece ends with a sort of rocking movement that’s hard to describe, but it gently lulled me back down from the peak, almost as if someone was rocking me to sleep. Filled with gorgeous similes, clever onomatopoetic words like “twinkling” and “flickering,” repetition, and personification, this movement is, at the risk of sounding cliche, magical. I love pieces of music that feature the viola, the most maligned of all stringed instruments. This one opens with them and eventually gives way to muted trumpets, cello, and then the string section as a whole recapturing the rocking feeling that the first movement ended with. It’s strangely mellow and pensive for a piece about a wedding, but I actually found it more moving because of this. After all, a wedding is not just a ceremony; it is the physical union of two people who are joined together in flesh and heart. It is a spiritual commitment as well as a physical one that we are never meant to break until death, so why not speak of it in terms of eternity? 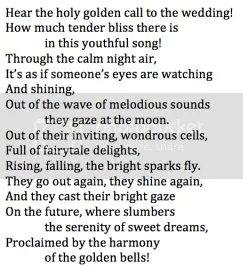 The words tell of the moon and “fairytale delights” the couple will soon enjoy as well as the “serenity of sweet dreams” they’ll share in the “harmony” of marriage. The soprano soloist in this is a perfect choice; her voice soars over the choir in an attempt to capture the thoughts of a bride who is listening to those bells waiting for her groom to arrive. In short, this movement captures the feeling of rapture that comes with true and all-encompassing love. The contrast between the previous movement, which is actually rather intimate in nature, and the communal experience of chaos in this piece is striking. You feel as if you, too, are part of the scene–that your life, your home, and your very way of life are being threatened. The ending measures are the most amazing of the entire portion. 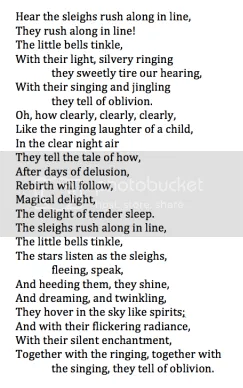 The chorus sings about waves of sound, the bells ringing and telling of the misfortune that is coming for them all. The waves are a fantastic choice symbolically speaking. After all, misfortune and good fortune do come in waves; they are both part of the natural ebb and flow of life. Also, the tide is a powerful force, one that cannot be controlled or contained. It is a fitting ending for a piece such as this. Oh, movement four! Be still my heart! I listened to this one with my hand wrapped around Wayne’s arm because I found it so moving. This is the funeral portion full of iron bells that tell of the death of one in the community. It opens with an oboe solo atop a palate of languid strings. (On a side note, I adore the oboe because, like the cello, it’s such an expressive, sensual instrument. It’s a perfect choice for this section.) The gentle sway of this piece when the bass soloist enters is reminiscent of a funeral march, a gentle walking on weary feet. It felt as if you were standing by watching the procession but are carried away with it, as if compelled to see where it ends—the grave. 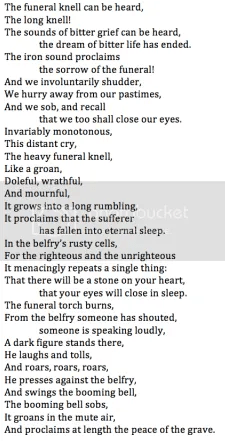 In the belfry’s rusty cells, for the righteous and the unrighteous, it menacingly repeats a single thing: that there will be a stone on your heart, that your eyes will close in sleep. I actually gasped when I read that section and heard it sung. The “stone” is speaks of is, of course, the tombstone, the one laid atop the grave. However, the image when paired with the booming voice of the soloist made it feel utterly ponderous. I could actually feel the weight of it pressing on my chest, as if I was experiencing a sort of death by proxy through the music. Through this symphony, the listener can experience a wide range of emotions from rapt wonder and joy to panic and, eventually, peace. 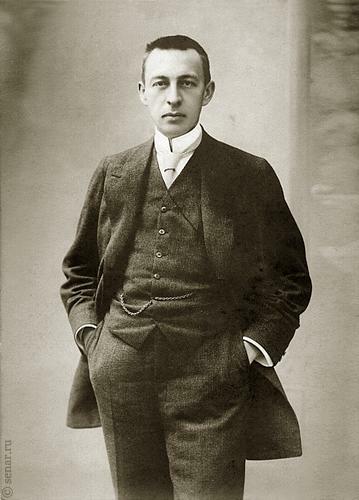 Rachmaninov masterfully leads listeners through them movement by movement, allowing them to experience something akin to the catharsis the ancient Greek dramatists sought. It combines the thoughts of Poe and one of his most musical poems with the methods of expression available to a musician, and becomes a sublime coalescence of sound. Previous postRead Poetry for a Good Cause! What a creative idea to put Poe’s work to music. I always thought his poetry had a cadence and lyrical quality to it. You describe the experience so well. I enjoyed this post very much! 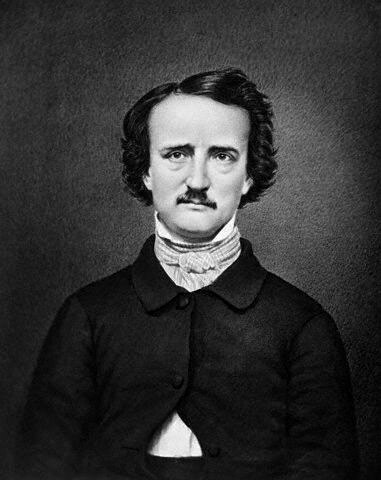 Poe is one of the most rhythmic and metrical American poets out there. For some reason, his stuff went over better in Europe during his life and right after his death, and many in Russia were fans of his. Apparently, a woman named Miss Danilova, a huge Rachmaninov devotee who sent him white flowers after every premier, wrote him an anonymous letter telling him of Poe’s poem and how a man of his sensitivity should set it to music. The story is widely told but unconfirmed, but I love the idea of the romantic composer creating such a work based on a fervent request from a fan!